Milton LeGrande Wood was born on 7 December 1879 in Phelps, Walker County, Texas. He was known as Doc. Robert Cummings Wood and Margaret Elizabeth Wynne appeared in the US federal census of 1 June 1900 in Grimes County, Texas. Other members of the household included Milton LeGrande Wood, Mary Estelle Wood, Robert Cummings Wood Jr., Willis Alexander Wood, Minnie Katie Wood, Mildred Sallye Wood and Minnie Catherine Lockett. He married Sallie Roberta Floyd, daughter of James V. Floyd and Sarah Roberta Parker, on 17 January 1904 in Grimes County, Texas. 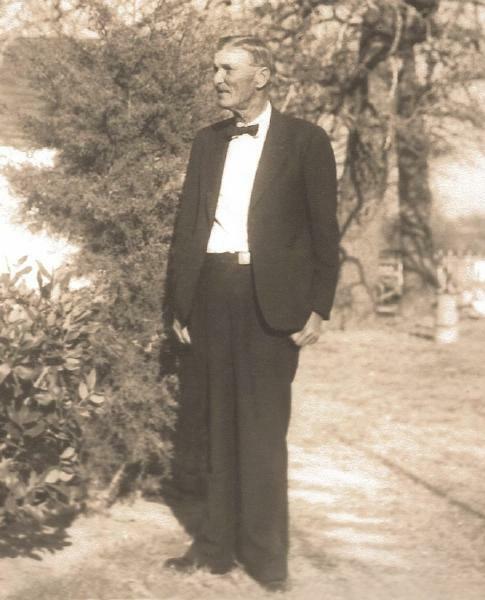 He relocated to Anderson, Grimes County, Texas, in 1913 after a devastating loss by fire of his store in Singleton, moved to Anderson, Mavinee Wood Fuqua published short family history. A photographic portrait was made of sisters Marie and Mavinee Wood, about 1917. Milton LeGrande Wood registered for the draft on 12 September 1918 in Navasota, Grimes County, Texas, while living with his wife Sallie in Anderson, and employed there as a deputy tax collector by C. H. Crutchfield. Milton LeGrande Wood and Sallie Roberta Floyd appeared in the US federal census of 1 April 1930 in Anderson, Grimes County, Texas. Other members of the household included Mavinee Elizabeth Wood and Marie LeGrande Wood. Doc and Sallie Wood appeared in a snapshot during their later years. Milton LeGrande Wood died on 27 October 1945 at age 65 in Anderson, Grimes County, Texas, . His death was officially witnessed by Marie LeGrande Wood. His wife Sallie Roberta Floyd became a widow at his death.